Fall season is by far one of the most colorful of all the seasons that passes. In the course of a year, we witness how beautiful nature can be as it changes colors from the stark white of winter, to the fresh green of spring, the sunny yellow of summer and the rich auburn shades of fall. With each change of season, fashion trends also changes and for women who are on a limited budget, building their wardrobe for each season can be a bit confining. This shouldn’t be the case for fashion forward females, you can still keep your style updated and stay fab this fall season by picking out the essentials. One fall staple for this year’s fall fashion is the blouse. Loose-fitting and sometimes sheer blouses look wonderful for the fall. Wearing slightly oversized blouses fully-tucked or half-tucked in over skinny jeans seems to be the fad. You can just polish this look with a pair of heels and ta-dah – that’s sleek fall fashion for less! There are several considerations when it comes to choosing appropriate colors for the season. This year’s fall calls for bright reds and burgundy so think red dresses, blouses and skirts. Check out your wardrobe for red blouses that you can flaunt out this season so you don’t have to purchase new ones. Just mix and match these with neutral colored pants or skirts so as not to overdo your splash of colors. For your office wear, black and whites are still the trend. You can easily go for plain white jackets over a black tank top. Even that top you have from three seasons ago will pass as chic and fashionable when mixed and matched with the right jacket and bottoms. Even with a tight budget, you can still achieve a cute and stunning look this fall. Thanks to perks and discounts that you can get from coupon code sites, shopping online for you fall wardrobe is easy on the pocket! Now you can enjoy fashionably trendy clothing for the season with as much as 10 to 20 percent discount. Feast your eyes and your budget with a wide selection of blouses, shoes and jeans, but do choose wisely. 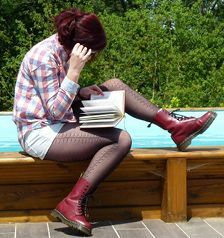 Be sure pick out the essentials – start off a classic pair of Dr Martens for they never go out of style! For a family of five and with growing kids too, budget allotted for clothing sometimes get cuts down or worse, totally spent on other necessities. Though this mom has always claimed that she’s at the right place at the right time when shopping, she learned that there are other great ways to save. Know when to shop. That’s buying stuff for summer during winter inventory sales and buying for winter during summer inventory sales. Use coupon codes. There are a lot of coupon codes and discounted items from/of brochures and online newsletters from frequently visited stores that one can use. Try discounts at CouponCodes4u. They have coupons for a wide-range of items, from books to home stuff, from baby stuff to gadgets and a lot more. But since were talking clothes and shopping, I suggest Endless coupon code – they offer discounts on favorite brands.There are traditional coupons that one can clip from printed advertisements but doing so could eat up a lot of time and if you have to buy a paper or a listing for it then you don’t really save that much. Sometimes, there are items too that you don’t really need. Ebay, Amazon and Company. There are a lot new items on these sites that you can get for half the price or lesser. And if you bought something that doesn’t really fit you or the kids, you can also sell them there. Scout for deals. I love deals and how I get to discover wonderful restaurants serving good food. Get a professional haircut for 80% the original price, visit a lovely city for 3 days at a hotel with breakfast for the price of a day and more. I’m sure you have a lot of tips on saving up and budgeting. I would love to hear them too. Comment away!